Industrial sewing machines are the workhorses of the commercial sewing industry. They are designed to be sturdy and easy to maintain. Most industrial sewing machines last for decades. Although industrial sewing machines come in numerous styles and configurations, they all have the same basic components, and troubleshooting them follows the same guidelines. Most problems with industrial sewing machines have to do with the stitching quality. Before beginning troubleshooting, oil the machine where required. The first area to troubleshoot is threading the machine. Make sure the machine is threaded correctly through all components, including the tension guide, the arm and the needle. Make sure the bobbin has thread. Check to see if the needle is facing the correct direction; the rule of thumb is that the bottom scoop in the needle should face the bobbin, and the vertical groove on the other side of the needle should face away from the bobbin. The thread enters the needle from the vertical groove side and exits on the bottom scoop side. Sew a 6-inch line. If the top thread does not catch the bottom thread, and the machine does not make stitches at all, it most likely is either a timing problem or the needle is backward. If the machine sews some stitches but skips others, that is wrong timing, the machine is threaded incorrectly, the tension is incorrect, or the wrong size thread is being used. If the upper thread breaks, the upper thread tension is too tight, there is a knot in the thread, the machine is threaded incorrectly, or the needle is bent. If the bobbin thread breaks, check to see that the bobbin is inserted correctly. Other causes are that the bobbin has been wound incorrectly, the bobbin tension is too tight, there is lint or other obstructions caught in the bobbin's tension guide, or the needle is bent. Thread breaks, both top and bobbin, also can be caused by a timing issue. Stitches that loop on the top or bottom of the fabric often are caused by incorrect tension, an incorrectly wound bobbin, a loose pressure foot, a burred needle point, or the bobbin thread coming out of its tension guide. Make sure the tab of the bobbin case is held securely under the bottom plate. If the tab can be seen, loosen the bottom plate, rotate the bobbin case until the tab is in position, then screw the bottom plate back down. Check to see if the needle is fully inserted and that the needle clamp screw is tight. Other causes are a bent needle, machine out of time, a loose pressure foot, or the plate under the pressure foot has become loose. 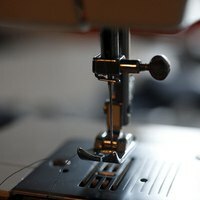 Most industrial sewing machine problems are easily repaired. Make sure there is power to the motor and that the drive belt is not frayed, broken or out of its groove. Follow the path of the thread from the spool through all the guides. Hand-turn the wheel and watch what the interaction is between the thread, needle and bobbin-case hook.